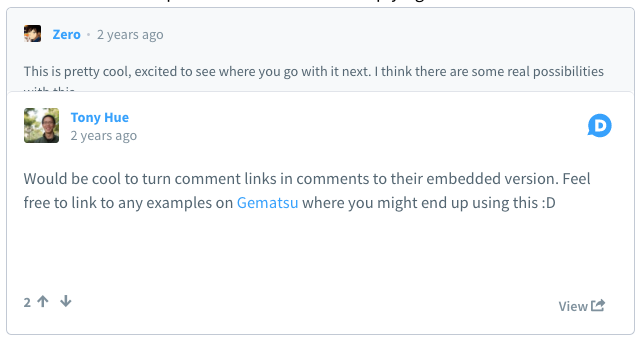 Embedded comments let you bring the best comments in your community directly into the content you publish on any website. No longer will you need to take screenshots of comments to share in a blog post. Just use the auto-generated embed code and paste it directly into any HTML web page. What can you do with embedded comments? Promote the top commenters in your community - Recognition is a huge motivator in communities that can increase engagement from your commenters. Over at xoJane, they publish a “Comment of the Week” series where they recap the most interesting comments from their community. 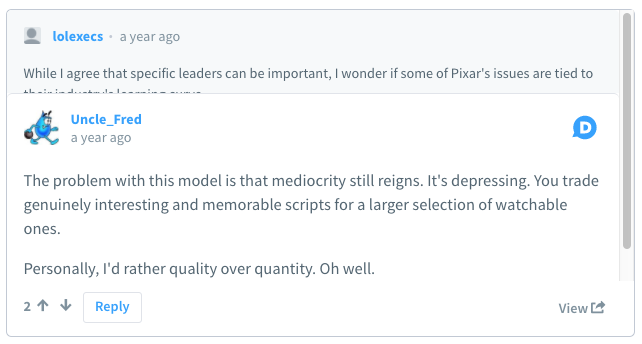 Promoting comments also lets you invite readers to join the discussion. Ask your readers a question - We encourage authors to be an active presence in the comments whether that’s replying to readers’ comments or asking them a question. A best practice to getting a new discussion going is to pose a question directly to your readers in a comment that you feature. Embed that question directly in your article so that readers are more likely to see it and share their thoughts. Create more compelling stories - When creating content, publishers care not only about it attracting an interested audience but one that leads to meaningful engagement. Engagement that sparks discussion, provide new perspectives, and connect readers closer to the story. Q: What happens to an embedded comment if the comment is deleted/pending? The embed turns into a Guest author and the comment text is removed. Q: Can I embed comments from a private profile? Q: How many comments does this show? With embedded comments, you can integrate the best content from your community to unlock more ways to create better content.